Friday again, they sure are coming round very quickly. We hope that you have had a good week and managed to get some crafting done. We have another project to share with you this morning. Stippled Candy Floss Sparkle Medium onto the plain tile. Onto acetate stencil one of the Bird Cages with Diamond then cut out once dried, placing it over one of the birds. Add lace and gems to finish off. Did you enjoy the shows at the weekend? What did you enjoy watching the most? We would really love to know what you enjoyed and which products were your favourites! 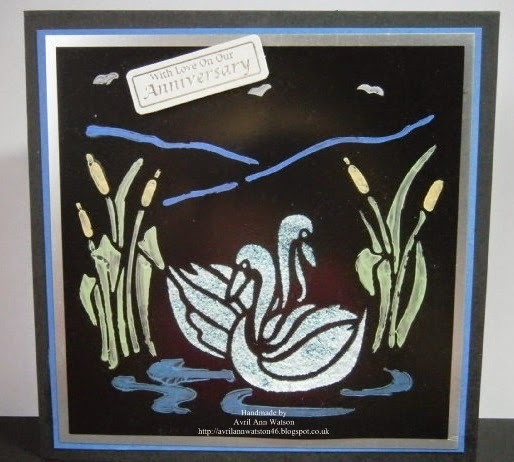 Today we have a beautiful Anniversary card from Avril to share with you all!